When you're on the road or in the outdoors, you can never be safe enough. This is why we designed this portable survival shovel to provide you with a survival tool that offers unrivaled practicability, functionality and security to make sure you stay ready for whatever comes your way. This hatchet is made to accompany you on all your travels and adventures. From using the highest quality high carbon steel and aluminum alloy to making sure that the folding shovel is easy to carry, we take all the right steps to bring you a multi-tool survival shovel you can count on! ✔ The shovel's head features a cutting-edge, graduated scale and wood saw making it perfect for digging, cracking ice or cutting wood. Click on the Add To Cart button now to order today to make your hunting, camping or hiking trips safer and more convenient. 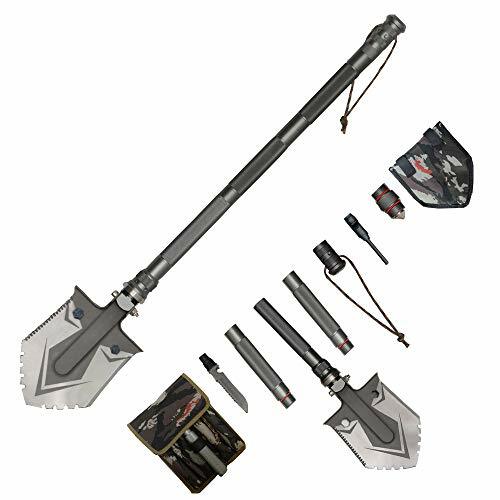 ✔ UNMATCHED DURABILITY: This survival folding shovel is made using the highest quality high carbon steel and aluminum alloy that is both lightweight and durable enough to provide reliable use even in the direst situations. Thanks to its unrivaled durability it's perfect for emergency situations and to accompany you on your outdoor adventures as a reliable partner to ensure your safety. ✔ ALL IN ONE SURVIVAL TOOL: To make sure you're ready for anything that can happen in the outdoors, we've designed this multifunction military shovel to give you the support and equipment you need to stay safe and be ready. It can be used as a screwdriver, knife, shovel, bottle opener, compass, rope cutter, saw chopper and features a stainless steel cone. ✔ COMPACT WITH CARRYING BAG: This folding camping shovel is compact and disassembles into smaller pieces making this convenient to travel with and just as easy to use. It comes with a fee carrying bag that lets you disassemble it to store it and accompany you wherever you go making this perfect for all your adventures. ✔ MULTI-FUNCTION APPLICATION: This folding shovel is ergonomically designed to provide you with comfortable and reliable use. Thanks to the wide variety of features it offers it makes the perfect choice for use in the outdoors, sports, camping, adventuring, survival and rescue, self-driving equipment, vehicle riding,emergency tools, gardening and so much more. ✔ 100% RISK-FREE PURCHASE: We make our customers our top priority which is why we only use the highest quality materials to provide you with multi-tool shovels that get the job done. We're confident in the quality of our products which is why we want you to feel the same way. Your purchase is backed by our 30 Day 100% Customer Satisfaction Warranty so that you can order today knowing your investment is risk-free. If you have any questions about this product by Waygan, contact us by completing and submitting the form below. If you are looking for a specif part number, please include it with your message.